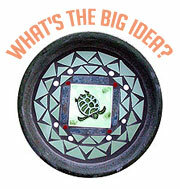 For Decorative Ceramic Tiles, Adirondack Chairs, Teak Furniture, and Cedar Furniture from Cape Cod. You won't find more stunningly gorgeous tiles anywhere on the web! Our artists draw inspiration from nature, romance and the good life, offering you fine-art-quality ceramic tiles that can be grouted into backsplashes, counter tops, fireplaces, turned into mosaic wall decor or used as decorative trivets. 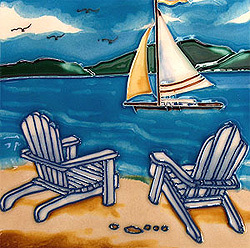 Choose from famous lighthouse tiles, cat tiles, flower tiles, animal tiles and more! Indoors and out, the glowing beauty of these tiles will help you personalize your house into a real home that says something special about you! Add simple grace to your indoor or outdoor living space with our FSC-approved teak furniture. Lovely, functional forms offer you comfort and style at truly good prices. Our teak furniture comes unfinished in it's natural state so that you can leave it as is, over time it will weather to a pleasing silvery gray patina or you can use a teak sealer to preserve the natural look. Choose from teak chairs, teak tables, teak benches, teak furniture sets and more! Teak's natural oil content means that it is self-preserving and can be used outdoors without shrinking, rotting, swelling, warping or splitting. No wonder teak has become such a popular outdoor furniture choice! Happy days are here again when you find yourself sinking deep into a classic adirondack chair on a lazy afternoon. We carry a full line of fabulous cedar furniture, treasured for its natural weather-resistance and durability. In addition to our handsome cedar furniture sets, we have cedar log beds, swings, dressers and other remarkable pieces that are sure to help you create a living space that is a sanctuary of repose, good taste and enduring comfort. Are you tired of the particle board and plastic being offered as 'furniture' at your local department stores? Do as we do on Cape Cod: turn to Malibu Furniture for real outdoor furnishings! Our beautiful Malibu Laguna Tables, Malibu Side Chairs, and more will help you create a place to live that emphasizes quality goods. Our Malibu furniture is durable, long lasting and beautiful, completing whatever your home's style is. If you're interested in greening your home, our Malibu furniture makes an option you should definitely check out! Our stainless steel cuff bracelets are the perfect fashion accessory. 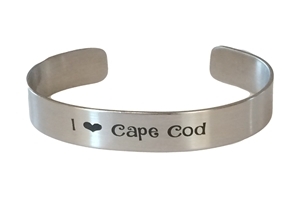 Permanently laser-etched with sayings that will inspire, or remind you of good times on Cape Cod or at the beach, they will enhance any style. Or, you can give them as gifts for a wedding, an anniversary, Mother's Day, or a birthday. Our bracelets are adjustable to fit any wrist. Get yours today! Have a loved one with allergies, multiple chemical sensitivities (MCS), or an autoimmune condition? Our untreated bare wood cedar furniture provides the framework for reducing toxic emissions and VOCs in your home. Your safe couch, bedroom furniture, or dining room furniture gets the right start here at Cape Cod Treasure Chest. We're the Perry family, and in addition to running CapeCodTreasureChest.com, we've got deep local roots, running the Big Fisherman Motel in North Truro, Massachusetts. Like most Cape Cod families, we are passionate about outdoor living. Our goal with this website is to help you find creative ways to make the most of fun in the sun and truly functional living spaces, both indoors and out. Whether home for you is east coast, west coast or somewhere in between, we're opening our treasure chest of great finds and great prices for you to help you capture some of the good life that we know here on Cape Cod.